Tile Productions is located in Apopka, Florida. We handcraft and sell stone and porcelain mosaics locally as well as ship anywhere in the USA and Canada. Our master tile mosaic artisan has over 30 years of experience and has a degree in commercial design. He is well known for his strong artistic ability and attention to detail. Please feel free to contact us with any questions or to place an order. You can also purchase right here on our website. We accept Visa, Mastercard, Discover, American Express and Paypal. Custom requests are always welcome. We will be glad to create a new piece from scratch or modify one of our existing designs (larger or smaller, material substitution, design modification, etc.). 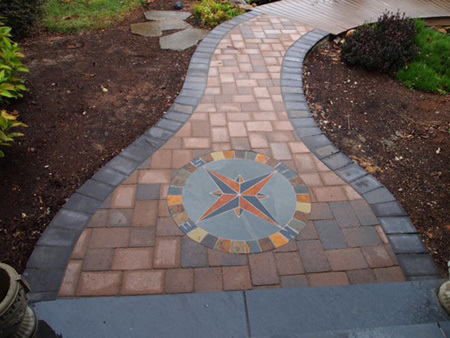 The price of each mosaic medallion includes materials and labor. Every mosaic is handmade by us upon ordering which takes approximately three to five weeks. The finished product is then shrinkwrapped, meticulously packed in foam, and guaranteed to arrive safely.